Last night Paul treated Simon, Stu and I to a trip to see The Mummers perform at the ICA in London's glitzy West End. 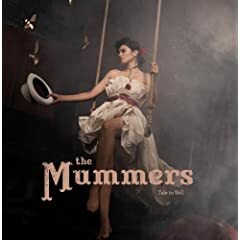 The blurb in Time Out says, "Dazzlingly accomplished headline spot from Brighton's orchestral pop outfit The Mummers, whose witty and sophisticated, showtune sounds recall Portishead, Björk, St Etienne, Goldfrapp and Lisa Minnelli and recently earned them a slot on 'Later With Jools Holland'." And I 100% agree. They were brilliant. Think Madonna's Dear Jessie or Prince's Christopher Tracy's Parade. i think your should try the golden filter as you would like them.